May 6, 2013: The world is changing. As greenhouse gases accumulate in the atmosphere, global temperatures are on the rise. Sea levels inch upward as polar ice retreats. Crops are growing in new places. The world is changing. The question is, can life change with it? A batch of genetically engineered plants orbiting Earth on board the ISS may have something to say about this. "Our environment on Earth is changing, so we need to know how plants respond to novelty," says molecular biologist Anna-Lisa Paul of the University of Florida. "Spaceflight is outside the evolutionary experience of any terrestrial organism. Learning how plants respond to this unique environment can also tell us how plants respond to new challenges on Earth." How much novelty can a plant withstand? 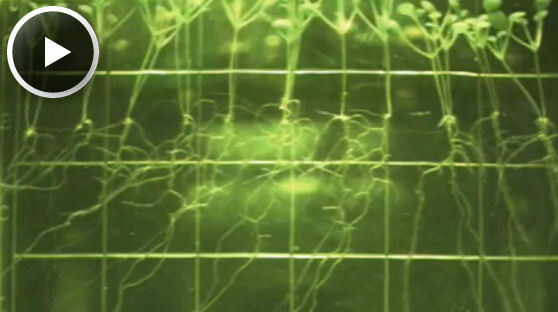 Glow-in-the-dark Arabidopsis has some answers in this week's ScienceCast video: Play it! Paul and colleague Rob Ferl are principal investigators of an experiment on the ISS called TAGES, the Transgenic Arabidopsis Gene Expression System. For the past two years, they have been using the ABRS experimental growth chamber on board the space station to grow a garden of Arabidopsis thaliana, also known as “thale cress.” Cameras captured growth rates, root patterns, and a strange green glow. Learning how plants adapt to new situations is crucial to climate change research. In terms of global biomass, plants outweigh mammals by a factor of 1000. They are a dominant part of the biosphere, playing a key role in the carbon cycle. Scientists and farmers have been experimenting with plants for centuries, yet at a fundamental, genetic level, much remains unknown. This is why Paul and Ferl have been putting Arabidopsis through its paces, exposing the plant to extremes of pressure, temperature, and drought. Most of their work has been done on Earth--but some extremes can only be found in space. "Removing gravity from the equation reveals unique aspects of cell growth and development that we cannot discover in any other way," says Ferl. "The International Space Station is a great place to do this." In a recent issue of the journal Plant Biology, they presented some of TAGES’ first results. "We have seen some things that surprised us," reports Paul. Paul and Ferl inserted a glowing “reporter gene” into the DNA of Arabidopsis that would be triggered by the plant hormone auxin. Auxin is important to how plants move and respond to their environment. By watching parts of Arabidopsis light up, they tracked the action of the hormone at the cellular level without actually dissecting the plants. 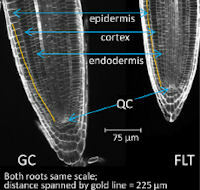 "We expected to find [auxin signals] in the gravity-sensing cells at the tip of the roots. Instead it showed up in the hypocotyls, the stem-like region between the roots and leaves," she says. An even bigger surprise was “skewing,” a pattern of root movement that, on Earth, helps plants navigate sticks and stones in soil as they search for water and nutrients. Paul recalls being with Rob Ferl and watching some of the first images of Arabidopsis come down from the ISS. “Are those roots skewing?” we asked. The pattern was definitely there. "It was pretty exciting," she says. "This is something we thought only happened in gravity." Paul and Ferl also observed how Arabidopsis used light as a gravity-substitute for telling “up” from “down.” With lamps shining overhead, roots grew clearly away from leaves, just like on Earth. “Arabidopsis has proven remarkably adaptable to the space environment,” notes Ferl. The details are not yet fully understood, but, thanks to TAGES, data at the cellular and genetic level are now available for study. "The more we learn,” says Paul, “the better partners we can be for life in a changing world."